Since reliable records were kept, four major hurricanes have directly hit the Tampa Bay area. They are the Tampa Bay Hurricane of 1848, the 1921 Tampa Bay hurricane, the 1946 Florida Hurricane, and the Storm of the Century of 1993. All of these storms had one major attribute: They developed in the southwestern Caribbean or off of central America, rather than the Atlantic or eastern Caribbean. This fact is worth noting. Commonly, major hurricanes in our part of the world come off the coast of Africa or the eastern Caribbean, and shoot off westward, affecting the US by hitting Florida or the southeastern states on the east, or going below Florida and shooting up to the Florida Panhandle or the various Gulf states (Louisiana, Alabama, Mississippi and Texas). These storms rarely go up the Gulf, and then make an immediate jaunt eastward to Tampa. When in the Gulf, they just go straight up. Exceptions, such as Hurricane Charley (which came out of the central Caribbean), have not affected Tampa (but almost did, and it was a near thing indeed!). The reason is that Tampa faces west, and the trade winds prevalent in our area move east-to-west. In other words, the prevailing winds keep the storms pushed away from us. Now, storms such as Elena, Irma and Frances have affected Tampa, but were not at the scale of a direct hit (although certainly not little storms – they all had an impact). For me, the concern with Irma is that it would go further to the west, hitting us at an angle to hit Tampa Bay directly, causing a potentially massive storm surge. However, it was fairly clear by the 8th of September that it would be a major wind event – but not a big storm surge creator. Still, I took precautions. The Storm of the Century in 1993 (often referred to as at the “No Name Storm”). See this animation for a powerful view of the storm’s path. 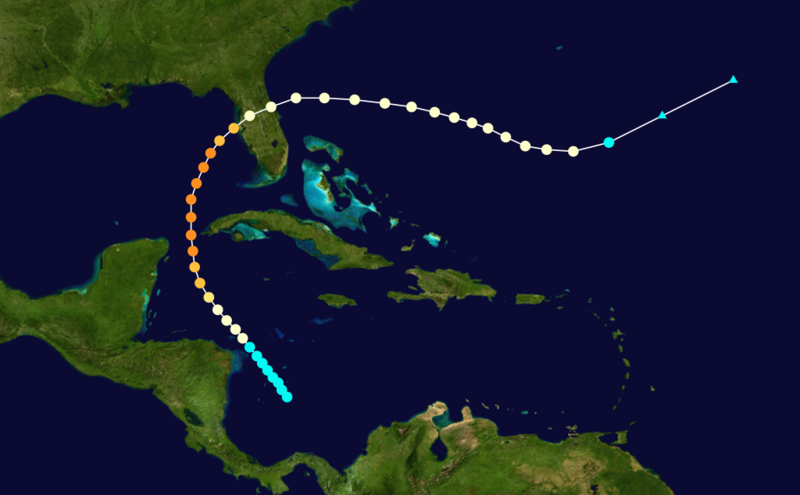 The track of the 1921 Tampa Bay hurricane, originating off of the coastline of the Honduras. 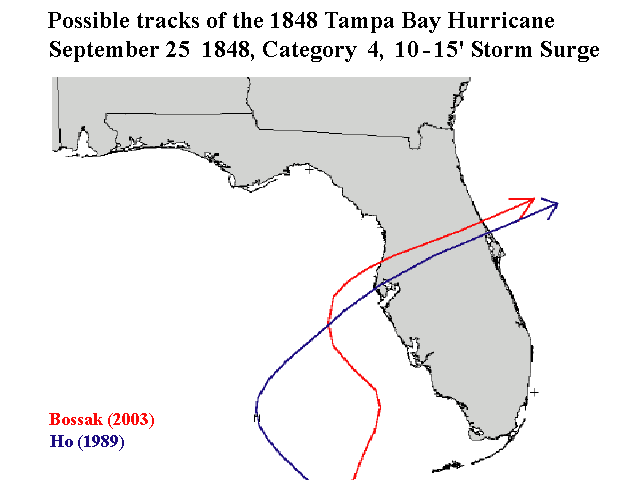 The Tampa Bay Hurricane of 1848 was an absolute monster storm; consensus is that the storm developed in the central Gulf region. 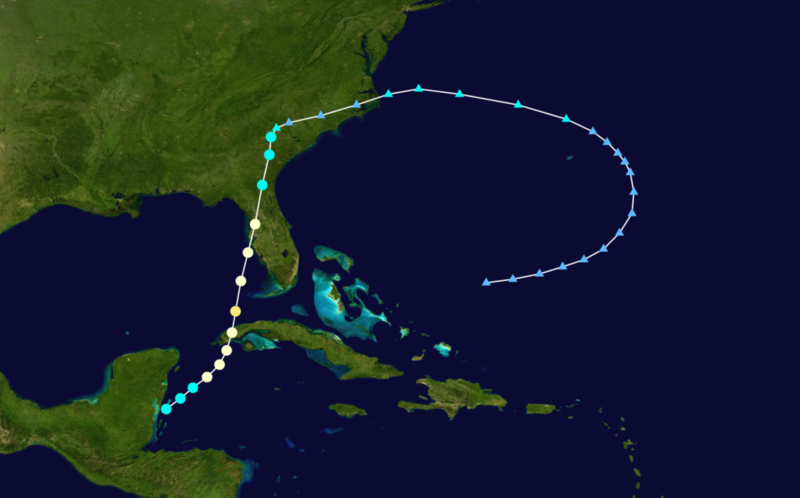 The 1946 Florida Hurricane developed off the coast of Guatemala. What’s of great concern with a direct hit to Tampa Bay is that the region has a shallow continental shelf, with very warm water. That is a bad combination, creating a potential of a devastating storm surge. A big storm coming directly at us will be quite dangerous. Remember, storm surges are where you see boats on top of trees 20 miles inland. Katrina. That kind of thing. Storm surge is the big problem in hurricanes. So, I pay very close attention to tropical disturbances in the southwestern Caribbean, because these could hit Tampa directly. A direct hit creates the massive storm surge that is actually the major danger in hurricanes. Disclaimer: I’ve lived in Florida, cumulatively, well over 20 years. I’m not an expert nor a meteorologist. But I have had to worry about the safety of my family in the face of big storms and I’m a bit of a nerd who has spent a lot of time studying the issue. This is only my viewpoint and observation. Feel free to disagree. Everyone fights about hurricanes, and the news doesn’t help by scaring the heck out of everybody, so the arguments tend to be between people who are scared witless – not the best combination.